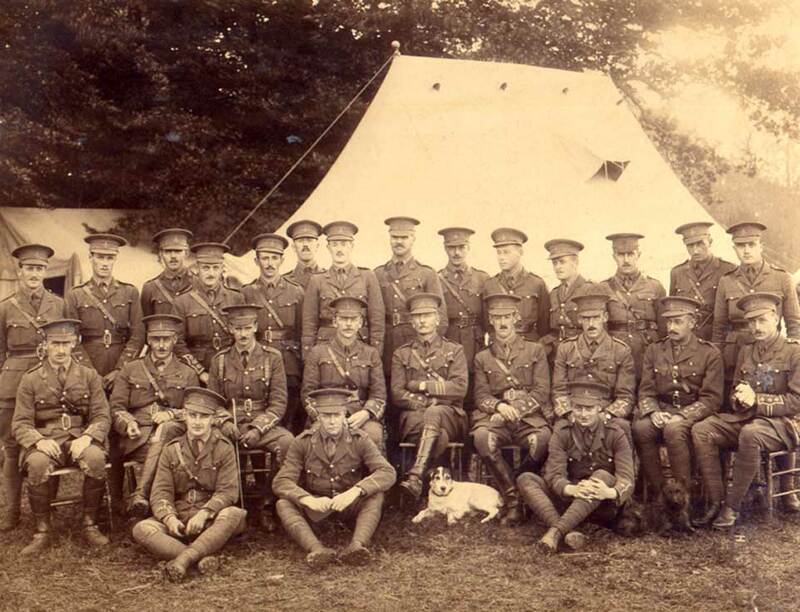 Select the thumbnail image above for a photo of the 2nd Battalion Officers in 1914 which opens in a new window. 2nd Battalion the Yorkshire Regiment. Husband of Nellie Jeffery, of Coldingham, Winchfield, Hants. Killed 24 October 1914. Aged 34. Buried in YPRES TWN CEMETERY. 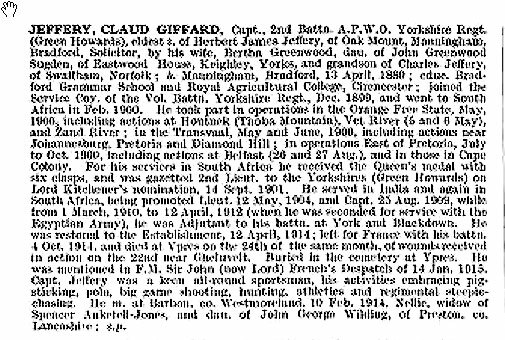 Born at Manningham, Bradford, 13th April, 1880, son of Herbert J. Jeffery, of Bradford. Husband of Nellie Jeffery, of Coldingham, Winchfield, Hants. 2nd Lieut., 14th September, 1901; Lieut., 12th May 1904; Capt., 25th August, 1909 ; Adjt., 1st March, 1910—12th April 1912; Egytian Army, 12th April, 1912—12th April, 1914. Served with the Volunteer Company in the Boer War, 1900-02, and took part in the march from Bloemfontein to Pretoria, including the actions at Brandfort, Vet and Zand Rivers, Kroonstadt and Johannesburg. Also in the advance eastwards and actions at Diamond Hill and Belfast (Queen's medal and 5 clasps. King's medal and 2 clasps). Proceeded to Belgium with 2nd Battn. in October, 1914. Whilst leading a party of volunteers to repel an attack by a large force of the enemy near Becelaire, he was wounded in the groin, on the 22nd October (mentioned in despatches). Died in hospital, near Ypres, 24th October, 1914. An officer who was with him in hospital said that Captain Jeffery was one of the most gallant men he ever met, popular with all officers and beloved by his men. When men from the regiment were brought in wounded to the hospital their first question was " How is Captain Jeffery ? " A biography of Captain Jeffery can be found in De Ruvigny's Roll of Honour. By selecting theimage below, a copy of this entry can be obtained. The image quality is not too good, but is sufficiently adequate to learn more of Captain Jeffery's background and family life.